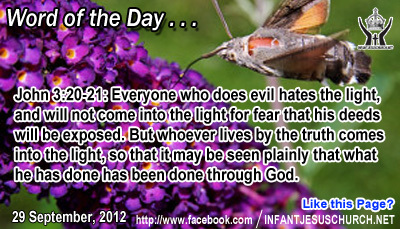 John 3:20-21: Everyone who does evil hates the light, and will not come into the light for fear that his deeds will be exposed. But whoever lives by the truth comes into the light, so that it may be seen plainly that what he has done has been done through God. Heavenly Father, we ask you to correct us softly as we place ourselves, our imperfections, failures and sins in your presence. Forgive and cleanse us by the blood of Jesus so that we might be clean and holy and blameless in your sight. O Lord, we don't just want to be forgiven; we want to be valuable to you and to the society. Please help us find our way to effectiveness. In Infant Jesus' name we pray. Amen. Jesus' reply to Nathanial's new faith is the assurance that Jesus himself will be the "ladder which unites earth with heaven". Jesus proclaims that he is the completion of the promise made to the Patriarch Jacob and his descendants. Jesus is the true ladder or staircase to heaven. In Jesus' personification, the divine Son of God taking on human flesh for our sake, we observe the union of heaven and earth – God making his dwelling with us and carrying us into the heavenly reality of his kingdom. Jesus' death on the cross where he beaten sin and won new life for us through his rebirth opens the way for each of us to come into a new association with God as his children. The Lord Jesus opens the way for every one of us to "ascend to heaven" and to bring "heaven to earth" in the daily situations of our lives. God's kingdom is present in those who look for him and who do his will. Through the gift of faith God opens a door for everyone to the heavenly reality of his kingdom. Do we see and believe the heavenly reality with the "eyes of faith"?